The temple is on the spot where Sriram rested after giving moksha to Jatayu as per sthala purana. Sita is not nearby as Ravana had already abducted her, hence only Bhoomiprati is seen. The Utsav Moorthy of Sriram (Valvil Raman) has four hands (Chaturbuja). Only here, Sri Rama gives his seva as Chakaravarthi (along with Sangu and Chakram). Mandangudi a small village, which is the birth place of Thondar Adi Podi Alwar, is about 2 Km. from here. There is one Brindhavan here which belongs to Ahobilam mutt 19th Jeeyar, Sri Maha Desikan. Approach : It is located at 5 kms from Swami Malai & 2 kms from Thiruvaikavur. Adhanur is just a kilometre from here. The buses from Swami Malai to Thiruvaigavur will stop here. The buses are very rare. No much facilities available here. Stay either at Kumbakonam or Swami Malai and visit this temple. Darshan to Thirumangaiazhwar with the shanku and the Chakra. UNIQUE WITHIN THE DIVYA DESAMS: Though the diety is Sri Rama, He has got here with his Shanku and the Chakra. You can not find such a posture elsewhere. Valvil Raman, Moolavar in Kidantha kolam in Bujanga Sayanam facing East direction. 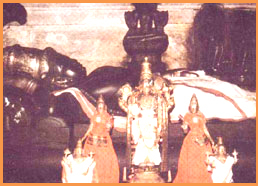 Prathyaksham for Chakravarthy Thirumangan Ramar and Raja Kruthra. Utsava Moorthy gives seva Valvil Raman has four hands (Chathur Bhujan) along with Sangu and Chakram. It is located at 5 kms from Swami Malai & 2 kms from Thiruvaikavur. Adhanur is just a kilometre from here. The buses from Swami Malai to Thiruvaigavur will stop here. The buses are very rare. No much facilities available here. Stay either at Kumbakonam or Swami Malai and visit this temple.